In a world of “school choice”, it’s easy to become overwhelmed with all the different types of schools: neighborhood schools, magnet schools, charter schools. As the Houston ISD School Board takes their annual vote to renew contracts for its in-district charter schools, parents, teachers, students and taxpayers in Houston deserve to understand the details behind HISD’s choice to create its own charter schools and the implications those choices have for our students and tax dollars. In Texas, charter schools get their certification to operate, or “charter”, from one of two places: either the State of Texas—KIPP and YES Prep are two big ones you might know—or from a local school district like Energized for Excellence Academy in HISD. HISD’s School Board will vote Thursday on the latter, as it does each year when it decides whether or not to continue its contracts with various charter operators running more than a dozen schools. Houston ISD was a pioneer in the concept of in-district charter schools in the 1990s. Many of these charter contracts continue today, and most years, the board renews them with little question. However, in a time when the district continues to struggle with flat enrollment and growing budget deficits, so much so that administrators believe closing schools and freezing teacher salaries are necessary, the district needs to take a long, hard look at whether its outsourcing arrangements are serving to educate kids or serving to create wealth. Though there is much conflict on Houston ISD’s School Board, I, for one, hope all our trustees would agree on the simple notion that public education in our district should be a not-for-profit endeavor. After all, we only have to look at Betsy Devos and Michigan to see what happens when for-profit entities are given free reign to run schools. The HISD school board should end charter partnerships with for-profit corporations. “The HISD program [TCA] benefits the district because teaching students via computer is cheaper. HISD said last year that the district earns $7,826 annually from the state for each Connections Academy student as long as the child completes required courses and passes the TAKS. The district takes a chunk of money and then passes the rest on to Pearson. There is no way to know how much or how little Pearson spends to educate a student or the resulting profit. The arrangement didn’t start out as a large money maker, but TCA’s enrollment has grown over the past few years, and as enrollment has increased, so has the revenue to HISD’s general fund. Part of the reason the school is so large now is that it’s being used as a state-wide profit funnel for Pearson. TCA doesn’t enroll students only from HISD boundaries but from all over Texas. Last year, TCA had over 5,600 students enrolled. 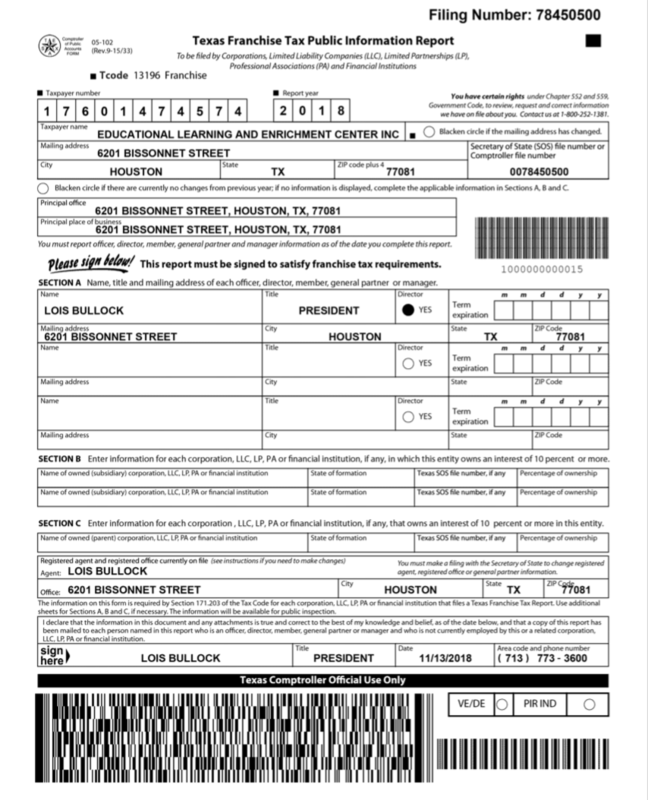 Why does Pearson need HISD to profit off of students outside of Houston? Good question. Remember at the beginning of this piece, I discussed how there are two different types of charter schools-those who get their charter from the State of Texas and those who get their charter from a district. Well, Texas Connections Academy/Pearson could never get a charter directly from the state—they don’t qualify. In Texas, charter operators have to be non-profit entities and Texas Connections Academy/Pearson is clearly a FOR-PROFIT entity. They’re allowed to get away with with this setup because infamous privatizers State Senator Florence Shapiro and then-State Senator Dan Patrick created a special loophole during the 2007 legislative session when they hatched a program called the Texas Virtual Schools Network. It’s under the auspices of this program that districts are able to “partner” with for-profit entities. The law even appears to have shielded TCA from the requirement to publicly report teacher-to-student ratios and other information about drivers of cost, which was noted in this 2012 policy brief from Raise Your Hand Texas. The question for us as taxpayers, parents and community members is this: Are we ok with corporations making a profit off of the management of public education? I’m not. The interests of children cannot be balanced against the bottom line of corporations. Children will lose every time. The HISD school board should be fundamentally opposed to for-profit entities running schools and close the door once and for all to this money-making scheme by changing their in-district charter policy to match the state’s stance of non-profits only. The HISD board should align its charter policy with the state and ban conflicts of interest among charter operators. State statute related to conflicts of interest clearly states that those persons that operate state-chartered schools cannot have a direct or indirect interest in entities doing business with those schools. In simple terms, the person who runs the school can’t also have a business that serves that school. Yet, in Houston ISD, such a conflict of interest isn’t a problem—or at least, isn’t against the rules. Let’s look at the following facts surrounding the operator of several of HISD’s charter schools, Ms. Lois Bullock, and how she also makes money from a business that deals with those schools. Ms. Lois Bullock is the president and owner of Educational Leadership and Enrichment Center Inc.
Educational Leadership and Enrichment Center Inc is a for-profit entity. Educational Leadership and Enrichment Center Inc. owns 7419 Bissonnet, 6107 Bissonnet, and 6201 Bissonnet. Energized for Excellence Academy has two campuses that sit at 6107 and 6201 Bissonnet. What is the conflict of interest? Well, every dollar that Ms. Bullock’s “non-profit” charter school doesn’t spend on educating kids is potentially another dollar that can be spent on increasing rents in future years. Who sets the rental rates? Ms. Bullock. HISD taxpayers are financing the profits of Ms. Bullock’s real estate ventures. Since state law specifically bans this type of conflict of interest from state-chartered schools, Ms. Bullock couldn’t profit like this from a state-chartered school. But in Houston ISD, our school board and senior administrators accept it. I can’t think of any acceptable answer to that question—especially when the board is yet again entertaining funding cuts to campuses and telling teachers to prepare for a pay freeze. Simply put, when HISD trustees approve of charter contracts like this, they’re decidedly putting profits and political interests ahead of our children. I think we should demand a higher standard for HISD and for our kids. Our elected officials only do what we allow them to do.